There's an extensive thread on the Ridgeline owner's forum about brake issues - specifically that the brakes are spongy or that the pedal has to travel before the brakes engage. For me this is a major priority. Any first hand experience with the G2's brake performance? I've driven my 2017 for 22,500 miles in mixed conditions and have not found this to be an issue at all. I find the brake travel is progressive, smooth (and definitely not spongy). Brake wear has been good too. Hardly noticeable wear when examined during the last tire rotation at 20,000 miles. This is an easy vehicle to drive smoothly - including smooth starts and smooth, consistent braking. Also, towing a 4,500 lb boat (which has surge drum brakes only) the Ridgeline's brakes handle this load with no issues or fade. It is possible that some do have a braking issue most likely due to air in the lines or similar but both the Gen 1 and Gen 2 brakes have been a non-issue and my 2010 G1 Ridgeline went 40K miles on the rear pads and over 60K miles on the front. i try to drive smoothly, both on the throttle and the brakes. I did notice that they aren't as good 911 brakes - don't know why that surprised me. I suspect that if you aren't beating on them, you won't have a problem. I might wonder how they would hold up to a lot of mountain dring though. but i thinkthat the brand is past that [30+ years ago]. I have a G2 RTL-E with 10,000 miles. I think the brakes are well modulated, easy to apply lightly for initial slowing and to apply smoothly increasing pressure to bring to a comfortable and smooth stop. This is the case even on snow and ice in our Montana winters. Overall, I am happy with driving characteristics of the 2017 model. I too have a 2017 with no brake issues at all. IN fact the other night on an off highway ramp the vehicle in front of me stopped suddenly and I hit the brakes quick and the truck stopped with plenty of room between me and the stopped vehicle. I also tow a 4000 lb travel trailer (townig it about 1500 miles in 2017) with electric brakes and the Ridgeline has no trouble towing or braking with the camper behind me. The brakes are responsive with normal travel and wear. I had a 2007 Ridgeline that went around 70K miles between changes and we towed this camper for two summers with it and 8 summers with a smaller one. The brakes were excellent in the 10 years I had that vehicle too. 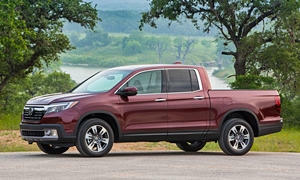 I'm extremely happy with this new Ridgeline. I have 20,700 miles on it since Labor Day weekend 2016. It's great on long or short trips in all kinds of weather (snow, rain, sun, etc). I'm looking forward to aother 8+ years or 150K miles whichever comes first with my 2017 Ridgeline! Thanks to all who responded. Although not a member of the ROC, I follow the posts there. Glad to read positive reviews. Thanks!